Technique identifies electricity-producing bacteria - AC INVESTMENT INC. Living in extreme conditions requires creative adaptations. For certain species of bacteria that exist in oxygen-deprived environments, this means finding a way to breathe that doesn’t involve oxygen. These hardy microbes, which can be found deep within mines, at the bottom of lakes, and even in the human gut, have evolved a unique form of breathing that involves excreting and pumping out electrons. In other words, these microbes can actually produce electricity. Scientists and engineers are exploring ways to harness these microbial power plants to run fuel cells and purify sewage water, among other uses. But pinning down a microbe’s electrical properties has been a challenge: The cells are much smaller than mammalian cells and extremely difficult to grow in laboratory conditions. Now MIT engineers have developed a microfluidic technique that can quickly process small samples of bacteria and gauge a specific property that’s highly correlated with bacteria’s ability to produce electricity. They say that this property, known as polarizability, can be used to assess a bacteria’s electrochemical activity in a safer, more efficient manner compared to current techniques. “The vision is to pick out those strongest candidates to do the desirable tasks that humans want the cells to do,” says Qianru Wang, a postdoc in MIT’s Department of Mechanical Engineering. Buie and Wang have published their results today in Science Advances. 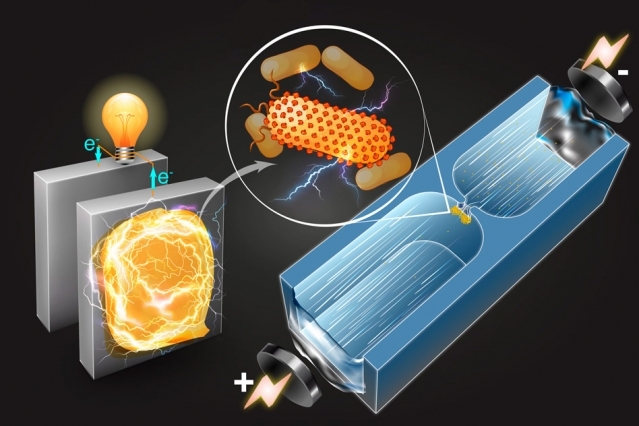 Bacteria that produce electricity do so by generating electrons within their cells, then transferring those electrons across their cell membranes via tiny channels formed by surface proteins, in a process known as extracellular electron transfer, or EET. Existing techniques for probing bacteria’s electrochemical activity involve growing large batches of cells and measuring the activity of EET proteins — a meticulous, time-consuming process. Other techniques require rupturing a cell in order to purify and probe the proteins. Buie looked for a faster, less destructive method to assess bacteria’s electrical function. For the past 10 years, his group has been building microfluidic chips etched with small channels, through which they flow microliter-samples of bacteria. Each channel is pinched in the middle to form an hourglass configuration. When a voltage is applied across a channel, the pinched section — about 100 times smaller than the rest of the channel — puts a squeeze on the electric field, making it 100 times stronger than the surrounding field. The gradient of the electric field creates a phenomenon known as dielectrophoresis, or a force that pushes the cell against its motion induced by the electric field. As a result, dielectrophoresis can repel a particle or stop it in its tracks at different applied voltages, depending on that particle’s surface properties. Researchers including Buie have used dielectrophoresis to quickly sort bacteria according to general properties, such as size and species. This time around, Buie wondered whether the technique could suss out bacteria’s electrochemical activity — a far more subtle property. “Basically, people were using dielectrophoresis to separate bacteria that were as different as, say, a frog from a bird, whereas we’re trying to distinguish between frog siblings — tinier differences,” Wang says. In their new study, the researchers used their microfluidic setup to compare various strains of bacteria, each with a different, known electrochemical activity. The strains included a “wild-type” or natural strain of bacteria that actively produces electricity in microbial fuel cells, and several strains that the researchers had genetically engineered. In general, the team aimed to see whether there was a correlation between a bacteria’s electrical ability and how it behaves in a microfluidic device under a dielectrophoretic force. The team flowed very small, microliter samples of each bacterial strain through the hourglass-shaped microfluidic channel and slowly amped up the voltage across the channel, one volt per second, from 0 to 80 volts. Through an imaging technique known as particle image velocimetry, they observed that the resulting electric field propelled bacterial cells through the channel until they approached the pinched section, where the much stronger field acted to push back on the bacteria via dielectrophoresis and trap them in place. Some bacteria were trapped at lower applied voltages, and others at higher voltages. Wang took note of the “trapping voltage” for each bacterial cell, measured their cell sizes, and then used a computer simulation to calculate a cell’s polarizability — how easy it is for a cell to form electric dipoles in response to an external electric field. From her calculations, Wang discovered that bacteria that were more electrochemically active tended to have a higher polarizability. She observed this correlation across all species of bacteria that the group tested. Wang says that, at least for the strains they measured, researchers can gauge their electricity production by measuring their polarizability — something that the group can easily, efficiently, and nondestructively track using their microfluidic technique. Collaborators on the team are currently using the method to test new strains of bacteria that have recently been identified as potential electricity producers. “If the same trend of correlation stands for those newer strains, then this technique can have a broader application, in clean energy generation, bioremediation, and biofuels production,” Wang says. This research was supported in part by the National Science Foundation, and the Institute for Collaborative Biotechnologies, through a grant from the U.S. Army.